After having spent the better part of the last two years primarily in parks with at least partial hookups like electric and/or water, we had grown pretty accustomed to cooking and eating full, made-from-scratch (or mostly from scratch) meals right from the trailer. 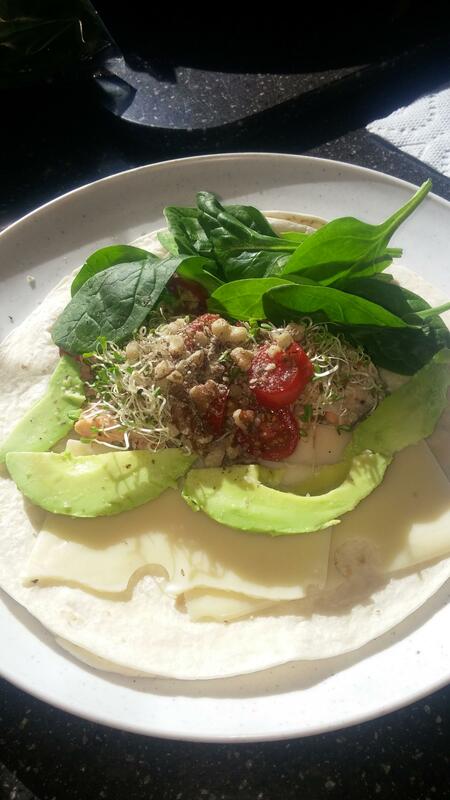 We are primarily plant based, whole food eaters that occasionally indulge in fish, seafood, eggs, dairy and potato chips. Meat however, has happily been off of our menu for a number of years and we don’t miss it a bit.We don’t use the microwave when unplugged, but we do have about everything else we need to prepare and cook full meals including a propane stove/oven, propane outdoor grill and descent sized refrigerator. But on the down side, we don’t have a dishwasher and we have to be very light and conscious of our water use for dishes. 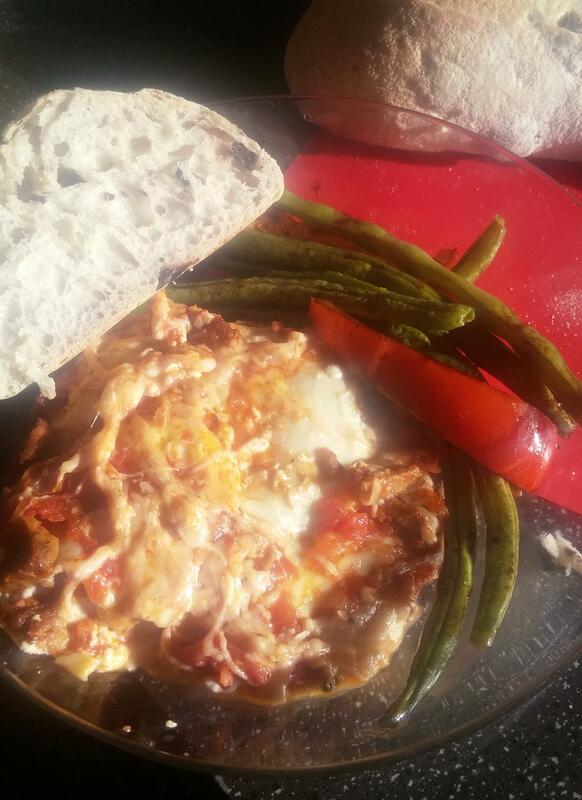 Although we were concerned about the added complexity of cooking and eating off-grid, after having spent the last couple of weeks testing it out we are actually very proud of the meals we have managed to prepare. It would be easier to stock up on canned goods and processed prepared meals but we don’t like to eat that stuff. At least not on a regular basis. This type of living actually lends itself very well to the fresh simple type of eating we do like to do anyway. We love fresh pastas, stir fries, salads and roasted vegetables. Also, although we love reading recipes and watching cooking shows, we really do not like following them. So, it is kind of like the Chopped kitchen most days in our RV. Believe it or not, cooking and eating at home is actually a fun thing we both enjoy now more than ever. I personally love seeing pictures of the dishes other people are preparing and eating online but I realize not everyone does. I even like when people share those quick videos of a dish being prepared in 30 seconds even when I find the actual dish to be completely disgusting and nothing I would eat in a million years. So, I do realize our food may not be everyone’s cup of tea but for anyone interested anyway, here is a sampling of some of the meals we have made in just the last few weeks mostly off the grid and miles out in the middle of the Arizona desert. 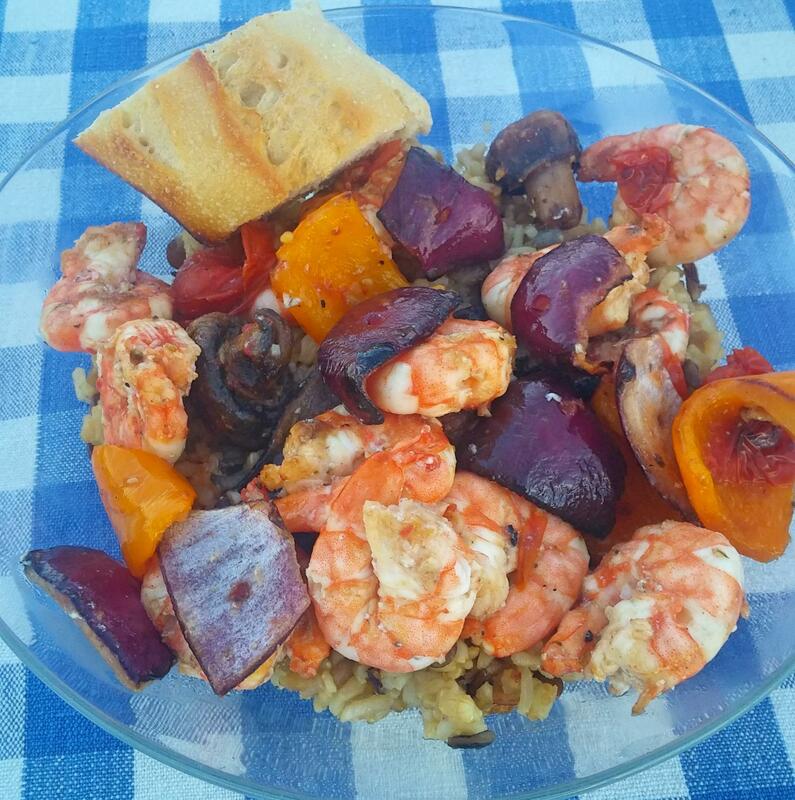 I would describe our culinary style as simple, colorful, and best when all mixed together in one bowl or plate. Bon-appetite’! 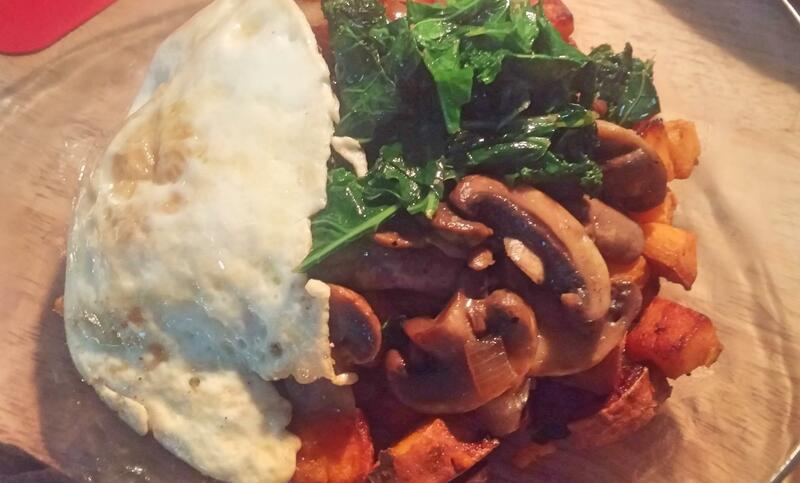 Sweet Potato Hash and Eggs: This is a staple breakfast in our RV. Sweet potato, greens of some sort, caramelized onion, mushrooms, and an egg. Usually we use a little maple to caramelize the sweet potatoes when for breakfast. 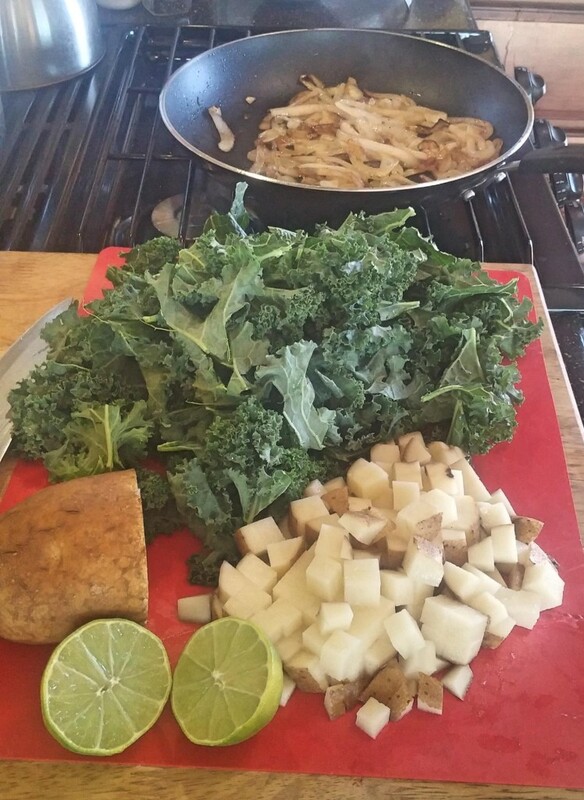 Various versions of this hash also make great dinners. 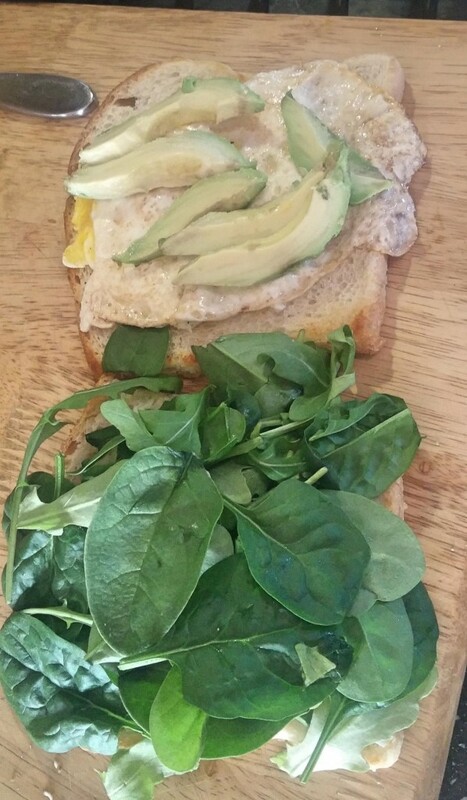 Egg Sandwich: Although Robin prefers her egg sandwich slightly more traditional, this is how I do an egg sandwich; lots of avocado and greens. 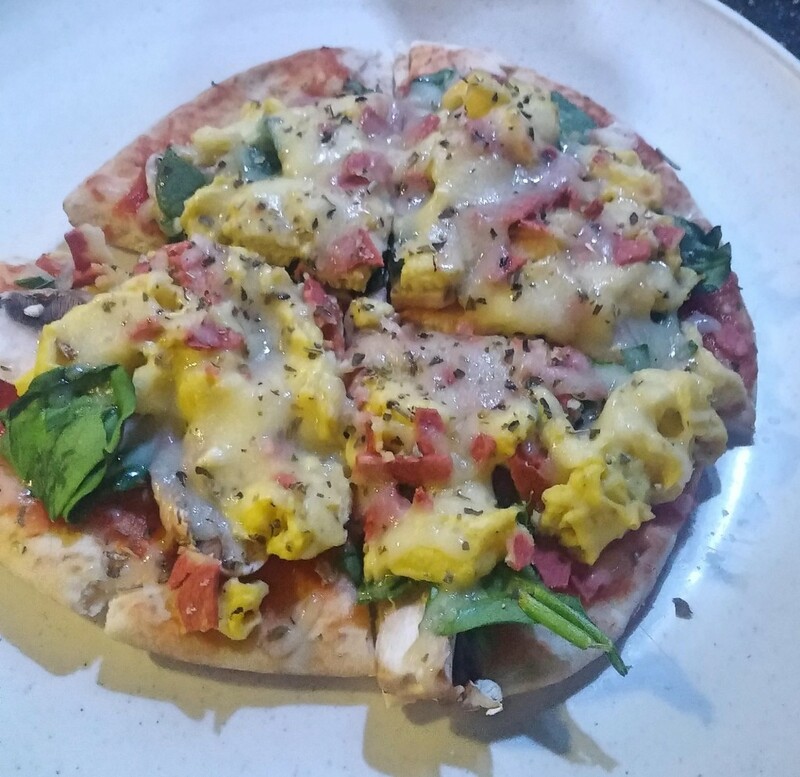 Breakfast Pizza on pita bread: Self explanatory. 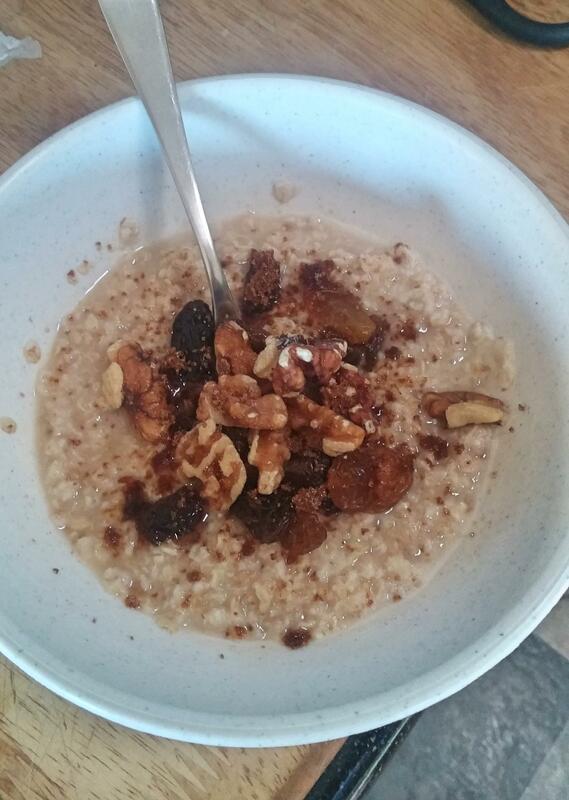 Oatmeal: Sometimes we keep it simple and jazz up oatmeal with nuts and dried fruit. Pretty easy boondocking dish. 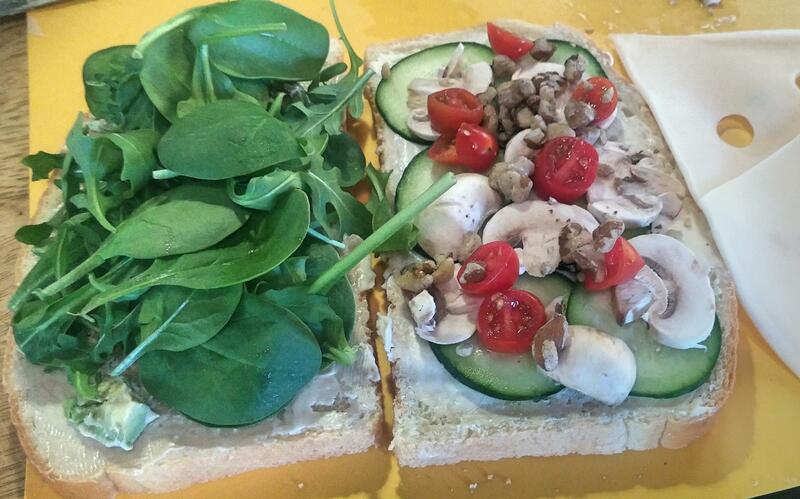 Veggie Sandwiches: I have always liked a sandwich for lunch and they are better than ever meat free. 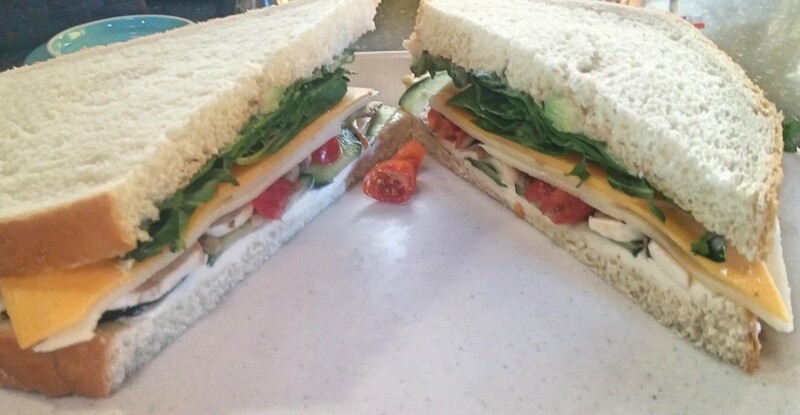 Greens, cucumbers, mushrooms, tomato, avocado, walnuts and swiss/cheddar on sour dough shown below. 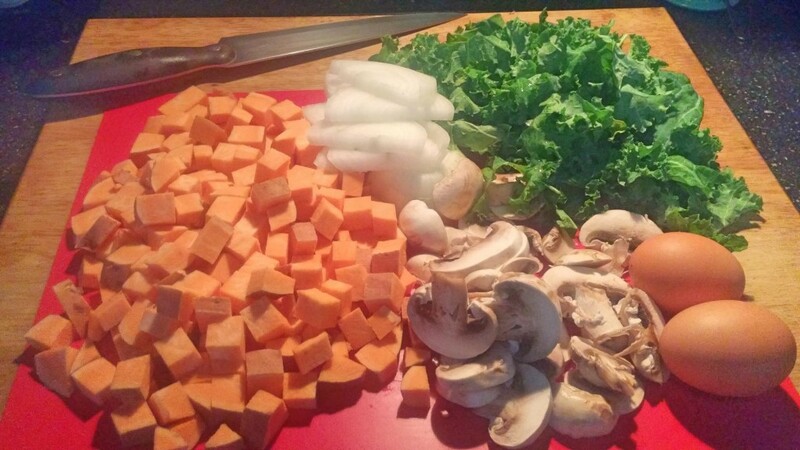 Soup: We love to make different soups. Usually self developed recipes or whatever veggies we have made into a soup or some sort. 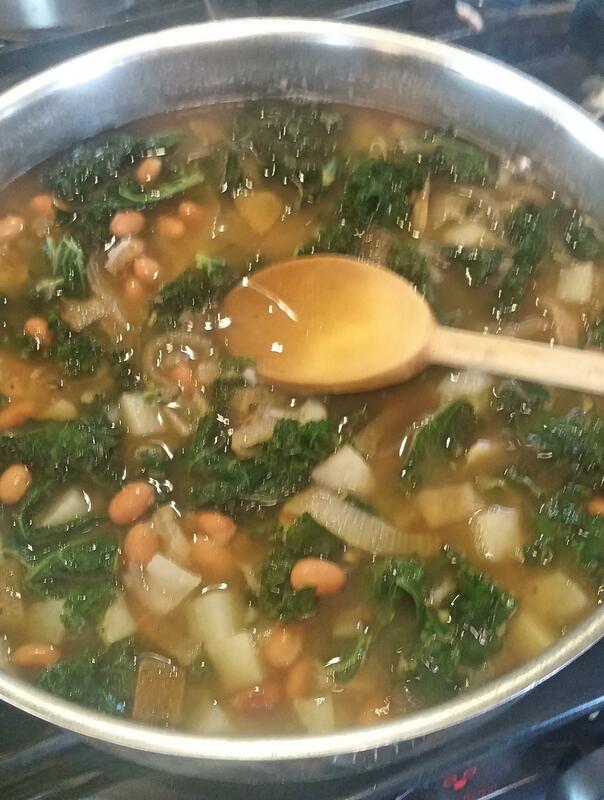 This one was a potato, pinto bean, kale and caramelized onion in a lime cumin broth and we ate it for New Year’s Day. 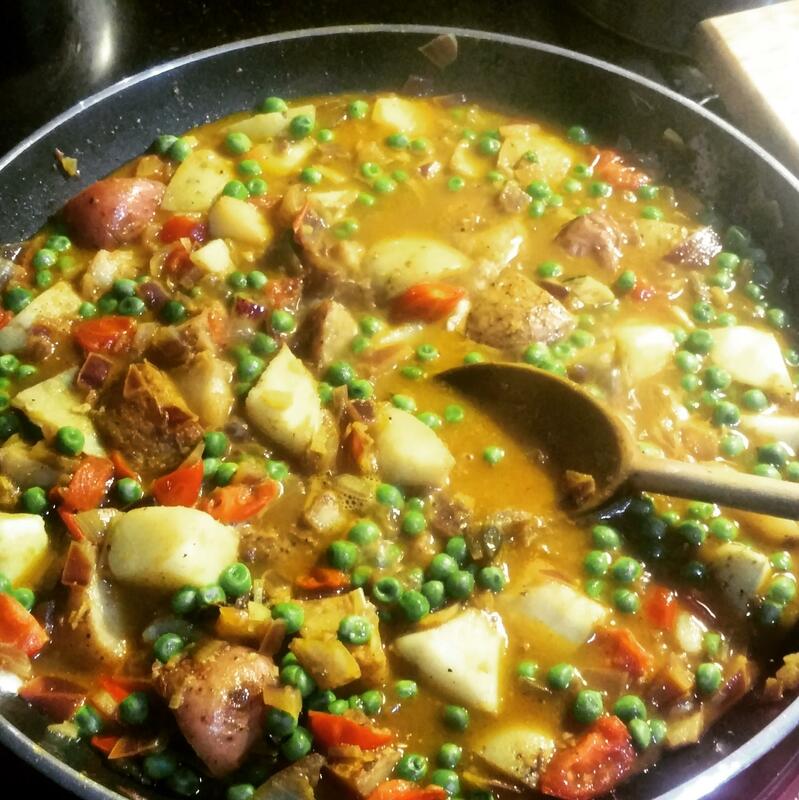 Vegetable Curry: We have been working on our Vegetable Curry making skills for years. 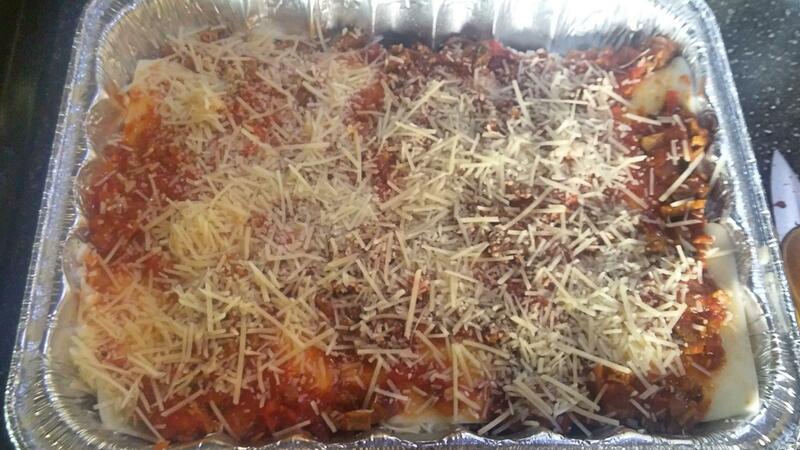 We don’t have this dish yet mastered, but they are getting better with every try. 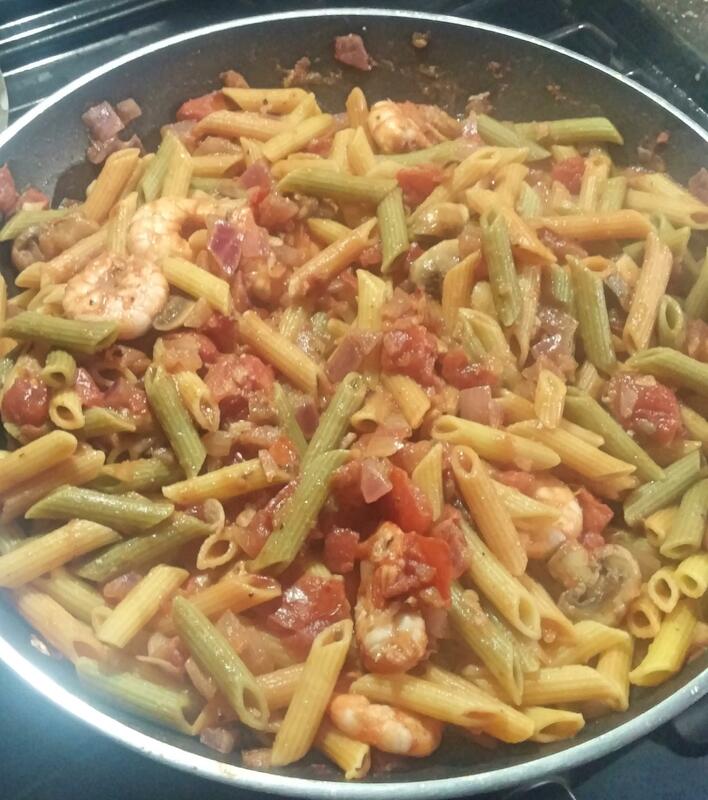 Pasta: We do eat pretty healthy and we try to eat balanced but we are not low carb and we are not gluten or dairy free. I realize those diets work well for some people but we are not them. Lemon, garlic, cherry tomato, mushroom pasta: We make some version of this a lot. 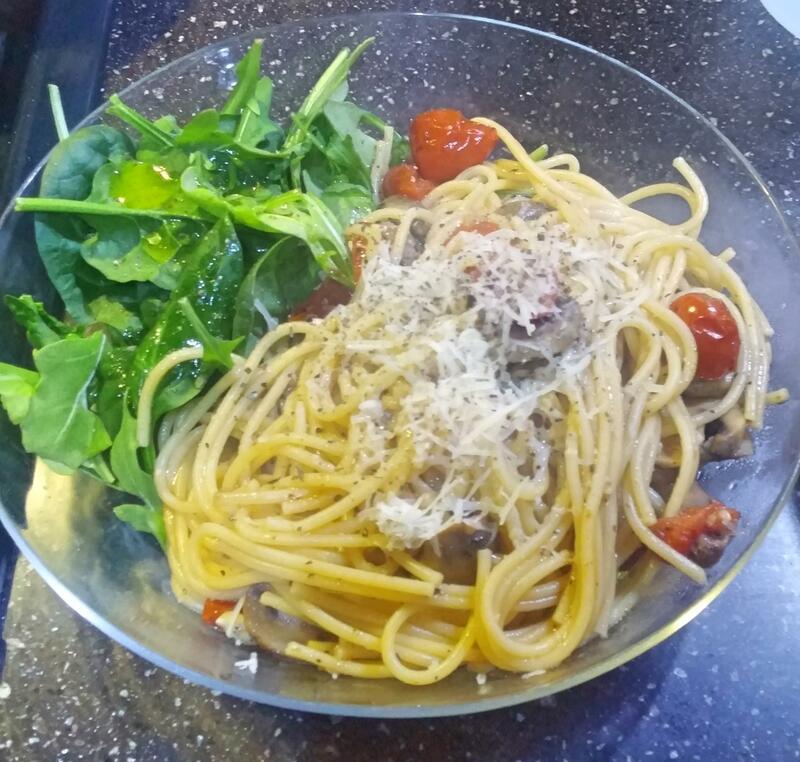 Just a light garlic lemon sauce with fresh cherry tomato and usually some greens, mushrooms and basil. In this case we added chopped walnuts and fresh grated Parmesan with a side arugula salad and simple lemon vinaigrette. Vegetable Lasagna: We have made various versions of the vegetarian lasagna over the years and this one that we had Christmas Day was basically my Grandmother’s recipe just with Tofurkey Italian Sausage crumbles instead of ground beef. 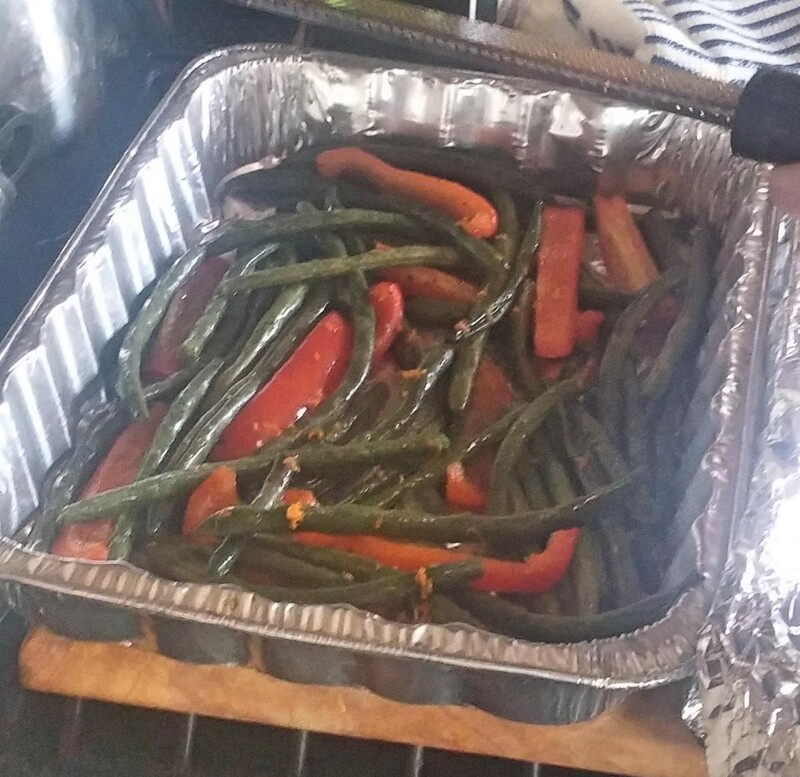 Matched with fresh roasted green beans and red peppers with a light balsamic glaze and sour dough loaf. 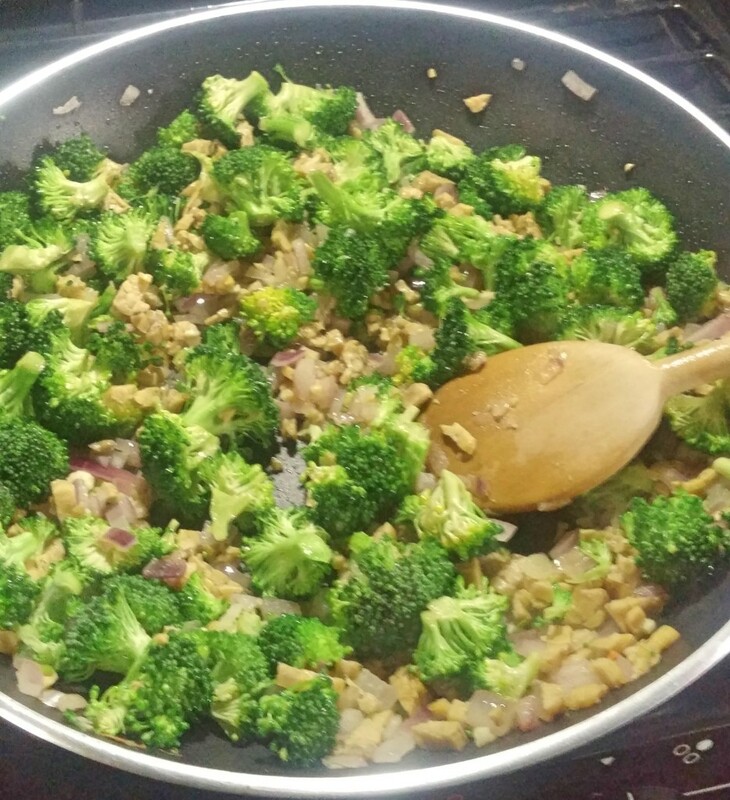 Stir Fried and Roasted Veggie and/or Shrimp Bowls. 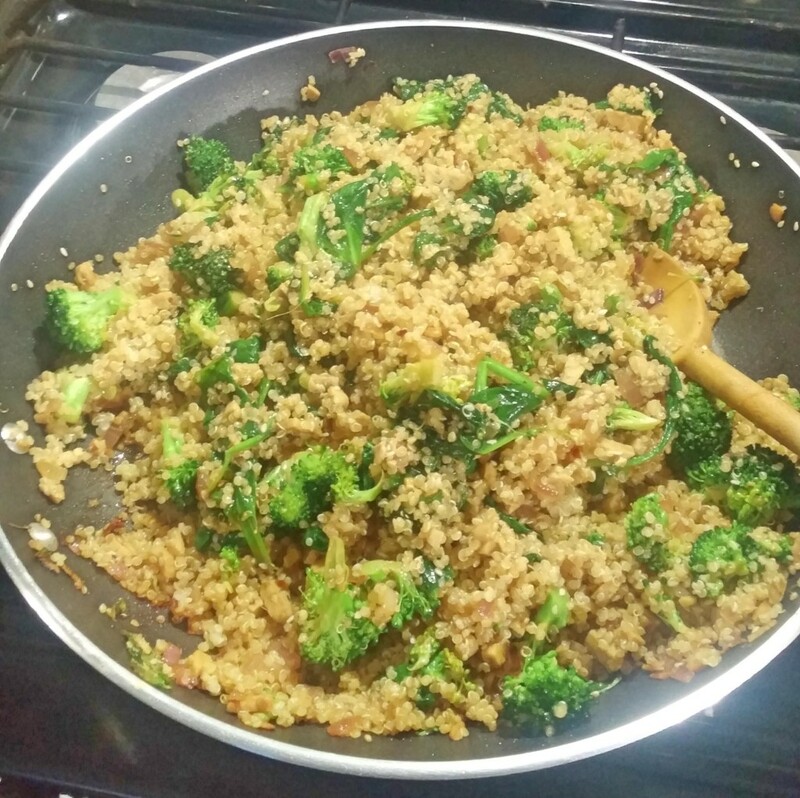 Sesame, tamari, broccoli, tempeh crumble stir fry with Quinoa. 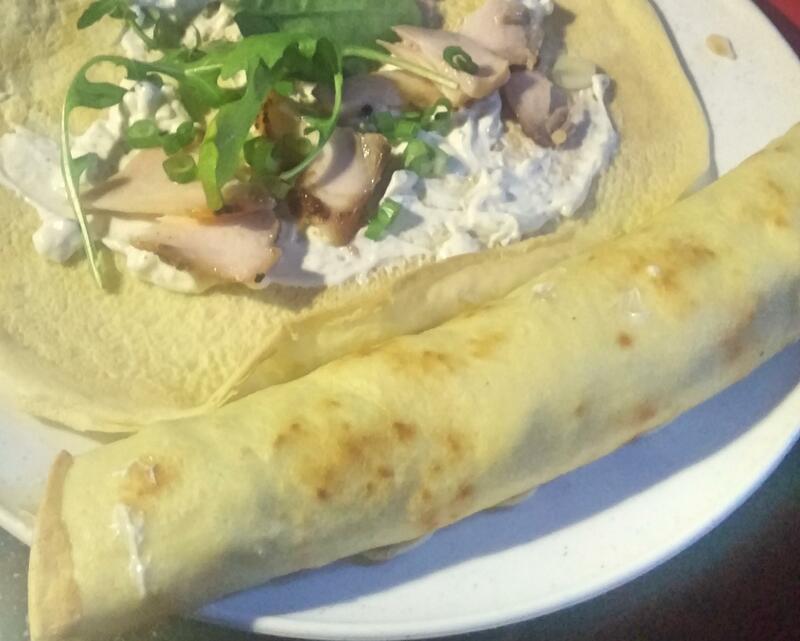 Crepes: We love to make crepes. This one was a goat cheese arugula version with Cedar Plank Grilled Salmon. We also like to do chickpea flour crepes. 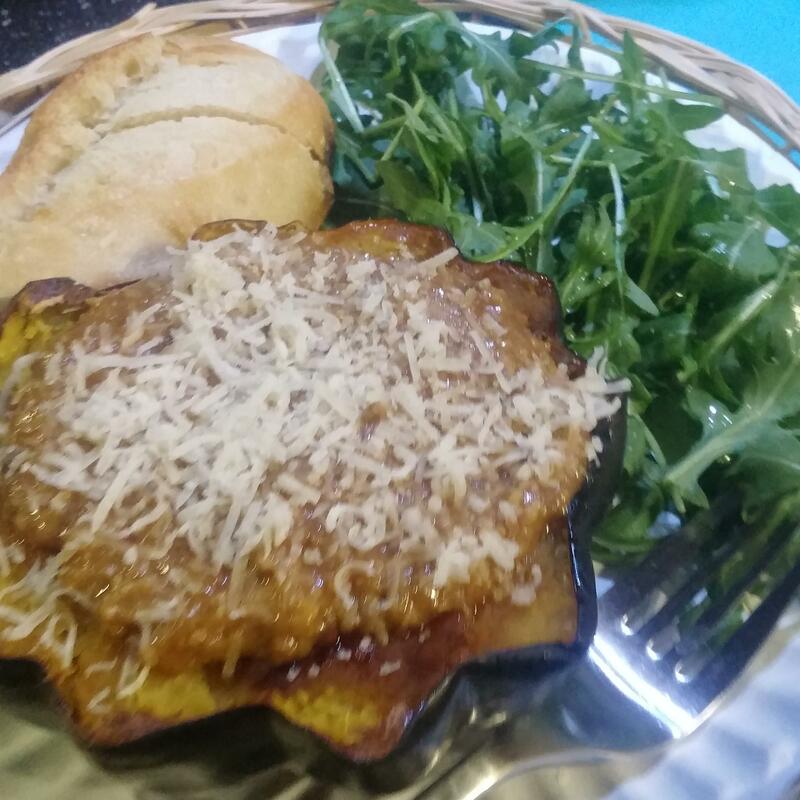 Sundried Tomato Polenta in a roasted acorn squash bowl with arugula salad. 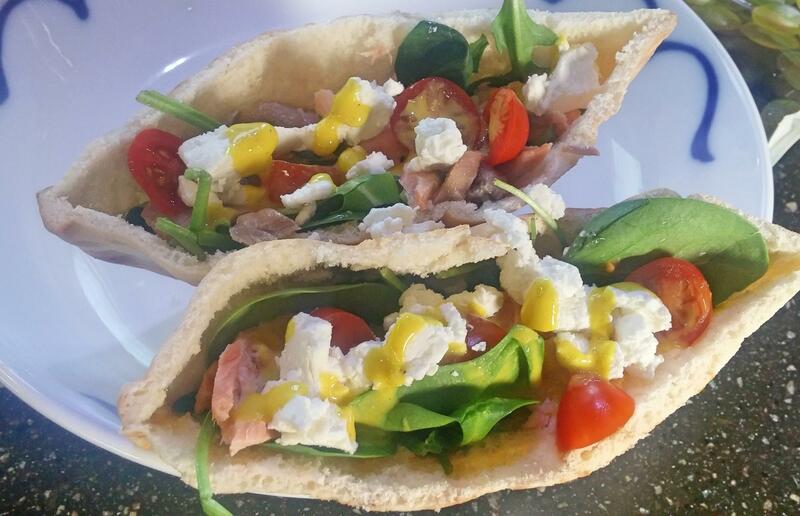 Roasted Golden Beet and Chick Pea Chipotle Tacos with all the fixin’s. 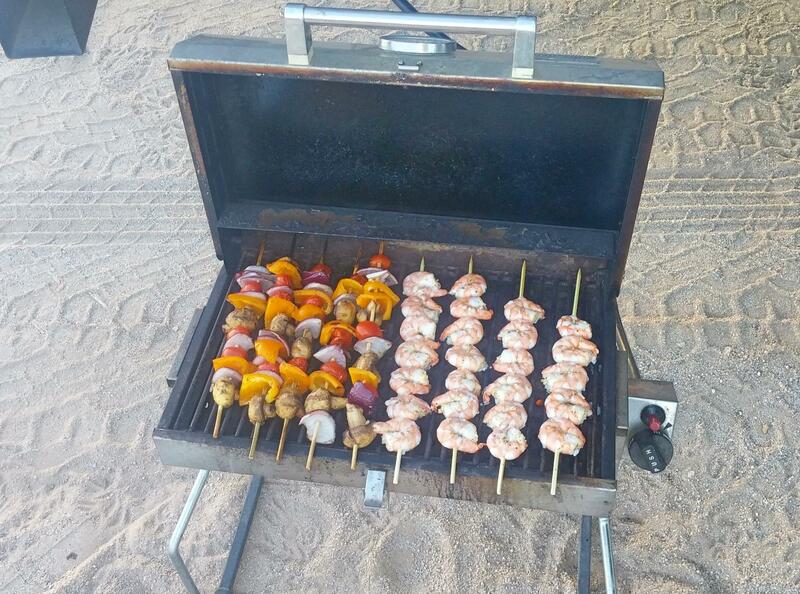 We actually took this to a potluck with friends in the desert. Yes, you still occasionally get invited to participate in a potluck with even when you live off grid in the desert. 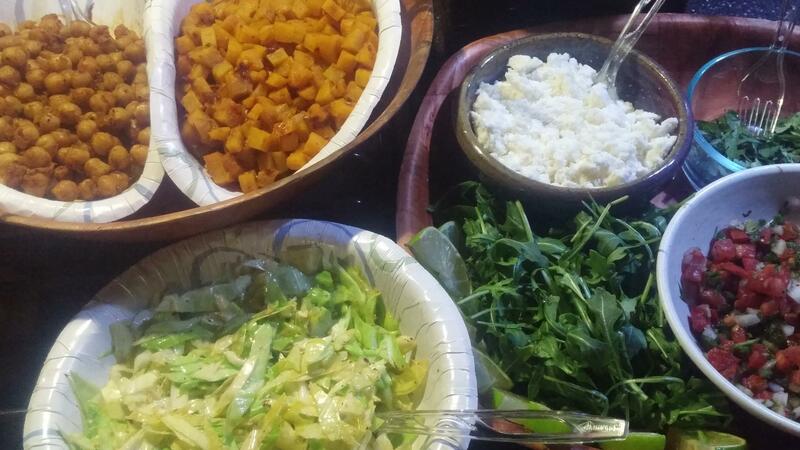 Salads: Salads are the perfect boondocking food and we eat them a lot. But don’t be confused, you won’t find any iceberg lettuce in our fridge, ever. 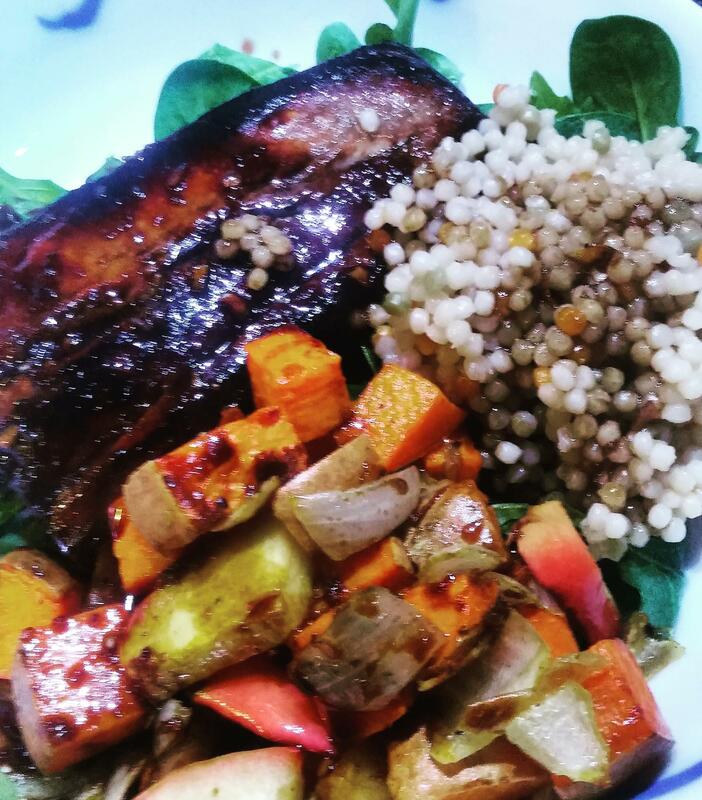 Grilled Mahi with roast sweet potatoes, apples, onions and pearled couscous over greens served with a honey-ginger glaze/dressing. 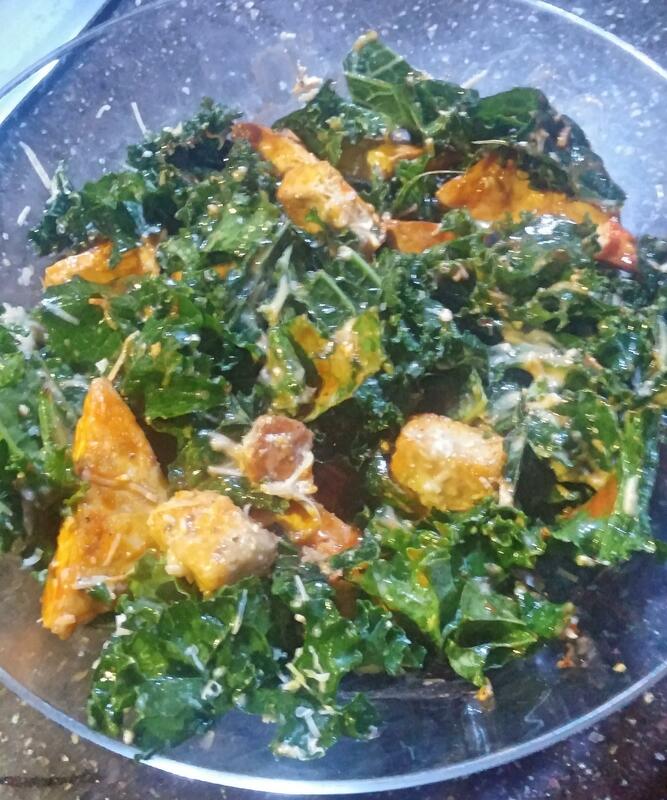 Buffalo Tofu Kale Caesar Salad: About what is sounds like. Great replacement for hot wings on Football Sunday. 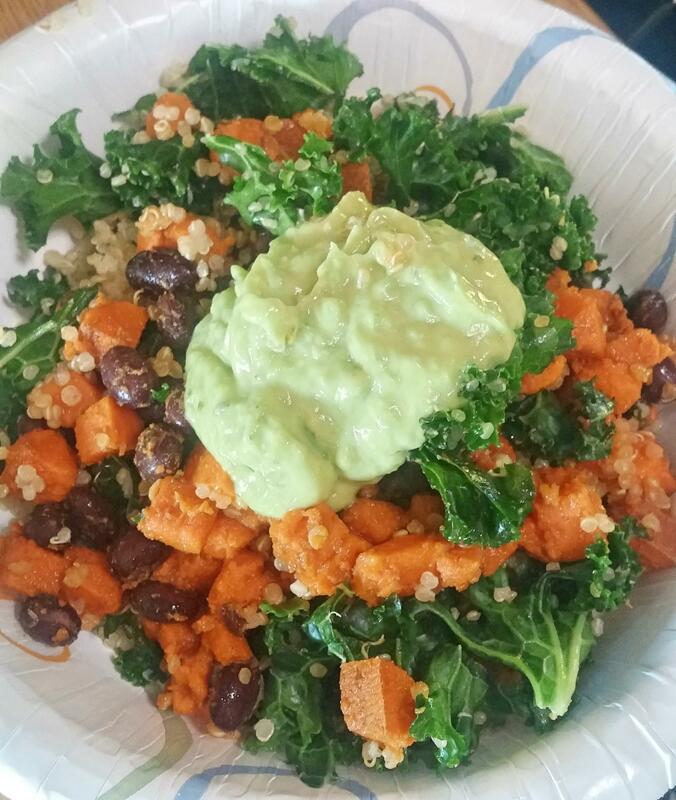 Southwestern Black Bean, Sweet Potato, and Kale Salad with Quinoa and Avocado Lime Dressing. Also brought this to a potluck dinner in the desert. Macrobiotic Bowls. We just started exploring macrobiotic eating and we generally love it although Robin is not yet as fond of sea vegetables and fermented cabbage as I am. It is all about the Yin and Yang. 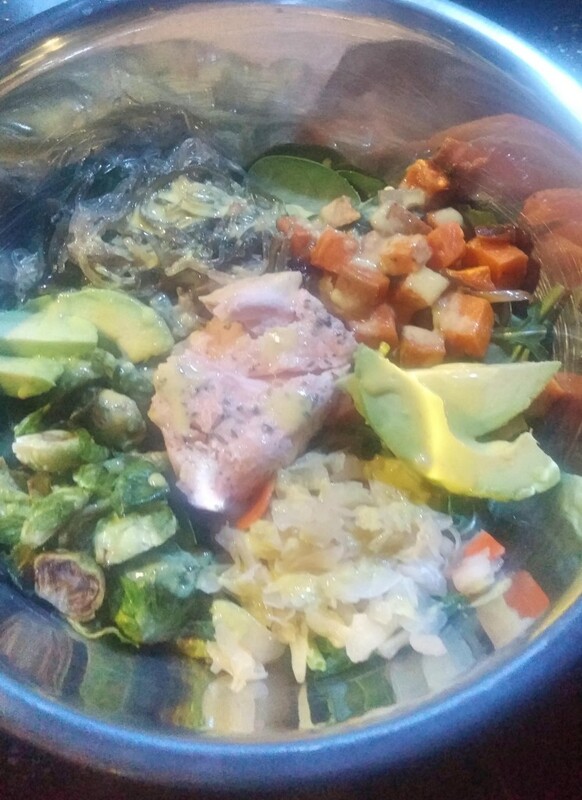 Anyway, this is a macrobiotic bowl we made consisting of baked salmon, sweet potatoes, brussels sprouts, sea vegetables, kelp noodle, cucumber, sauerkraut and avocado over baby spinach and arugula with maple, turmeric, and tahini dressing. 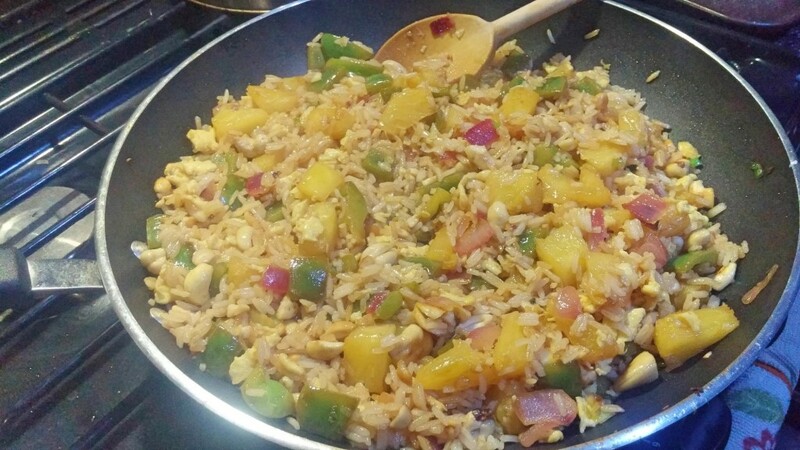 There may have been some brown rice or quinoa in there too, I can’t remember. 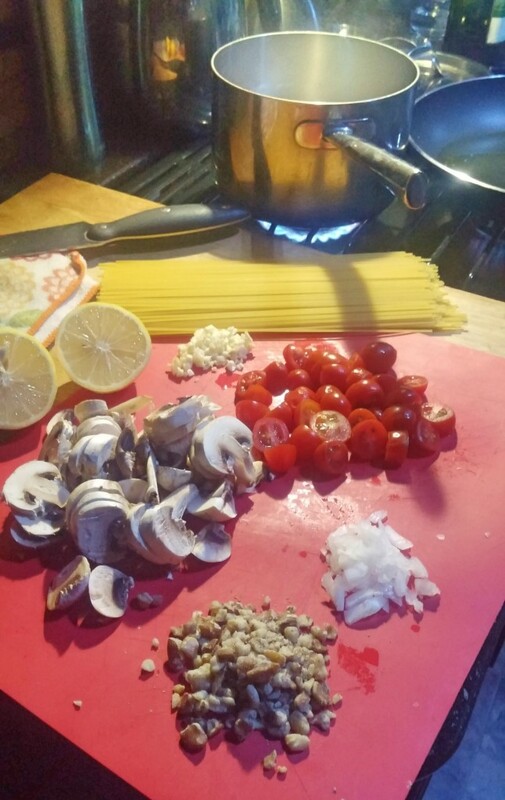 Well that is a photo tour of what is going on in our RV kitchen, what is going on in yours? This entry was posted in Arizona, boondocking, Food, Jeremy Blog, Uncategorized. Bookmark the permalink. Thank you for these beautiful pictures of your receipes and information about how you eat healthy in your rv. We eat a whole food plant based diet and love to learn more from like-minded people. How do you find and store your fresh produce on the road? Hello Jo Ann. Thanks for reading. For produce we have the standard RV type fridge with small produce bins but descent space. Since we don’t eat meat, we have more room for veggies. We also keep a basket on the counter that usually has potatoes, garlic, onions, ginger and maybe a squash or two. This gets stored inside the oven when we move. We also have one of those hanging hammock type of produce baskets hanging from under the kitchen cabinets that we keep fruit in. These are nice because you don’t have to do anything with them when you move.